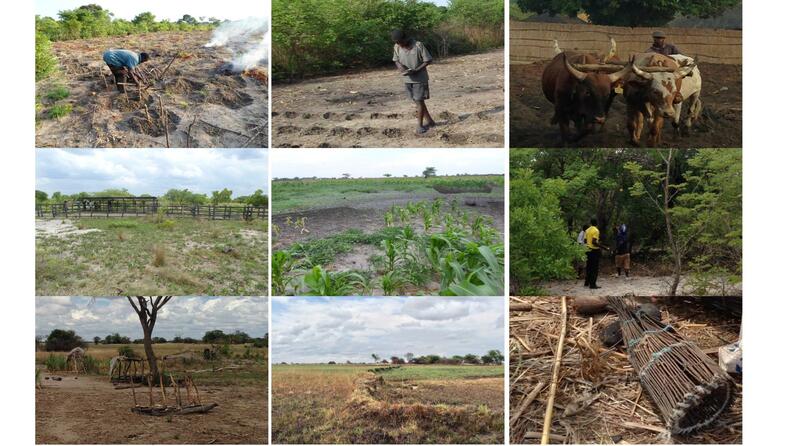 Evaluating agricultural best practices, mindset and social values systems in Barotse floodplain, Zambia. Nutrition-sensitive landscapes address the relationship between agriculture, nutrition and environment. Increasing farm productivity and diversification of nutritious food crops are key issues in agricultural development, as improved productivity and diversification provide opportunities to reduce poverty, food insecurity and malnutrition. Adoption of new practices is one, out of many, key issues to help improving food and nutrition security. Farmers’ mindsets and social values systems are therefore important, as people interact with their environment and decide what and how to farm. To test this hypothesis, two Zambian communities, Kapanda and Lealui, each located in a different agro-ecological setting are compared. Data was collected using the following techniques: participatory mapping, transect walks, semi-structured interviews, infographics, personal observations, survey questionnaires and focus group discussions. During the various research activities, I particularly focused on ‘What works well?’ and investigated best practices and effective, positive experiences. I highlighted best practices of example farmers within the community, as I assumed that this (appreciative inquiry) approach enhanced farmers’ pride, trust and confidence and stimulated farmers to share knowledge and experiences. Findings indicate that there are indeed possible interactions between agro-ecological systems, mindsets, values systems and participatory learning processes and this should help to design context-specific programs that enhance adoption and bring about impact. The research findings show similarities and differences between the two case studies. Both villages are located in the Western Province, Zambia, dealing with similar climate conditions, seasonal variability’s (flooding and droughts) and soil types. Both villages are characterised by low-input farming systems, in which farmers use simple tools, such as hoes and hands, and produce maize, rice, cassava and vegetables, amongst others. Agricultural practices with regard to field preparation, soil fertility, water supply, weed and pest management tend to be similar. However, in Kapanda the agricultural practices are mainly rooted in traditional agriculture (chimetene) (see Figure 1). Lealui, on the other hand, shows greater variability in agricultural practices, as the economic network (infrastructure, input and output market), access to financial loans and external inputs is better. Consequently farmers apply conservation agriculture, cultivate permanent, larger fields, rear cattle and produce cash crops for the regional market (see figure above). In both Kapanda and Lealui, farmers tend to enjoy learning opportunities with concrete, practical solutions. They are quick and practical problem solvers and are willing to learn from experiences and experiments. It is, however, quite remarkable that the mindsets of farmers in Kapanda show risk-averse behaviour. One can even say, that farmers avoid ‘being different’ or ‘take individual initiatives’. Socio-cultural values systems emphasize harmonious family ties and specific gender and age-related roles. Families are bonded by kinship and traditional practices and it is important to stay loyal to complex rituals that pre-describe relationships. Being loyal to the community, showing respect for existing rites, tradition and honouring elderly and their habits are highly valued. Witchcraft is an accepted way to cope with all kind of uncertainties and issues. These strong believes in superstitions results in even stronger risk-averse behaviour. In general, farmers in Kapanda aim at improving existing techniques better (as compared to implementing new techniques). These mindset and socio-cultural values systems partly explain why farmers still apply traditional agricultural practices and why the adoption rate of (new) conservation practices is generally low. Farmers in Lealui show, on the other hand, a different profile. Their mindset can be characterised as individually orientated, curious and willing to experiment with new techniques. Furthermore, socio-cultural values such as ‘tradition, discipline, morality and obeying rules and order’ flourish. This results in a relatively orderly and dutiful community and farmers enjoy working with experts, detailed instructions and procedures (strictly by the book) to improve their farm productivity. In Lealui, farmers tend to be less impulsive and are more likely to build a (financial) buffer, which can be used to ensure farm resilience and stability. Generally, it was found that contrasting place-related life conditions, created a heterogeneous assemblage of mindsets, values systems, agro-ecological practices and farming styles. It can be argued that the mindsets and socio-cultural values are a ‘best solution’, ‘rational’ or ‘best behavioural response’ to cope with place-related life conditions, and influence the adoption of new techniques. What is ‘best’ is partly based on semantic discourse. Furthermore, the study argues that rural development approaches and technologies that support, meet or fit currently, existing mindsets and social development stages (values) are more likely to be adopted. Choosing a teaching approach and developing communication strategies that honour, endorse and appreciate current motives, qualities and values systems are key. This entry was posted in Agriculture, Policy, Rural Development, Thesis and internship possibilities and tagged adoption, Agro-ecology, appreciative enquiry, best farming practices, land use systems, nutrition sensitive landscapes, participatory learning, socio-cultural values, technology, Zambia by RSO-Students. Bookmark the permalink. Great writing. Are there plans to follow this up with practical implementation to improve on the poor farmers’ lives.